A mother and her two young sons were among five people killed when a bus hit a group of pedestrians. Joanna Warren, 37, and Jacob, 5 and Leyton, who was four months old, died when the bus crashed on Sunday at Ingoldmells, Lincolnshire. Mrs Warren's husband, Anthony, aged 41, is in Boston's Pilgrim hospital where his condition is described as serious. 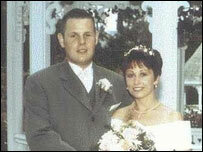 Also killed in the incident were Richard Rhodes, 32, and his wife Paula, 30, from Mansfield, Nottinghamshire. The Warren family's teenage daughter, Jenica, 14, is at her father's bedside. Officers from Lincolnshire are now looking at whether mechanical failure or driver error was to blame for the incident. 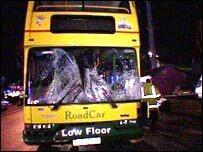 Police have interviewed the driver of the Volvo bus, a 50-year-old man from Louth, as well as a number of witnesses. The bus, owned and run by Lincolnshire RoadCar Ltd, was on a regular service between Chapel St Leonards and Ingoldmells. A spokesman for the company, which is based in Lincoln, said: "It is a tragic event and we are all very distressed here. "There is an investigation going on involving ourselves, the police and the Department of Transport and until that is concluded we have nothing further to say." The accident happened outside the car park near the Fantasy Island pleasure park at about 1700 BST on Sunday. Police have dismissed suggestions that cars parked on double yellow lines near Fantasy Island had played a part in the collision. Inspector Les Parker from the Lincolnshire Police Roads Policing Unit said: "At this stage, it is clear that for some reason, the bus failed to stop on the approach to a pelican crossing and collided with a BMW car and people crossing the road. "It is too early to say why, but we are looking at a possible mechanical defect and/or driver error. "This incident shows how a pleasant day at the coast can so quickly end in tragedy. "Our thoughts and sympathies are with those close to the deceased and the injured."